T. Pulkkinen, M. Alho (Editors): Space Research in Finland, report to COSPAR, online publication. T. Pulkkinen, M. Alho (Editors): Space Research in Finland, report to COSPAR 2016, 46p., 2016. 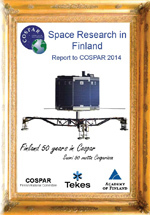 T. Pulkkinen, S. Merikallio, P. Stigell (Editors): Space Research in Finland, report to COSPAR 2014, 72p., 2014. (hard copies and PDF available). 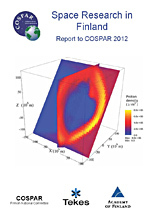 T. Pulkkinen, S. Merikallio, P. Stigell (Editors): Space Research in Finland, report to COSPAR 2012, 66p., 2012. H. Koskinen, S. Merikallio, P. Stigell (Editors): Space Research in Finland, report to COSPAR 2010, 106p., 2010. H. Koskinen, S. Merikallio, P. Stigell (Editors): Space Research in Finland, report to COSPAR 2008, 90p., 2008. (hard copies and PDF available) List of publications 2006-2007. H. Koskinen, S. Merikallio, P. Stigell (Editors): Space Research in Finland, report to COSPAR 2006, 75p., 2006. (hard copies and PDF available) List of publications 2004-2005. H. Koskinen, P. Stigell, M. Takala (Editors): Space Research in Finland, report to COSPAR 2004, 80 p., 2004. H. Koskinen, P. Stigell, M. Takala (Editors): Space Research in Finland, report to COSPAR 2002, 75 p., 2002. K. Ahola, H. Koskinen, J. Lahtinen (Editors): Space Research in Finland, report to COSPAR 2000, 70 p., 2000. J-P. Luntama, S. Urpo (Editors): Space Research in Finland 1992-1993, 34 p., 1994. J-P. Luntama, S. Urpo (Editors): Space Research in Finland 1990-1991, 33 p., 1992. J.Tuovinen, S. Urpo (Editors): Space Research in Finland 1988-1989, 27 p., 1990. S. Urpo (Editor): Space Research in Finland 1986-1987, 23 p., 1988. S. Urpo (Editor): Space Activities in Finland in 1984-1985, 18 p., 1986. S. Urpo (Editor): Space Activities in Finland in 1982-1983, 12 p., 1984. S. Urpo (Editor): Space Activities in Finland in 1981, 12 p., 1982. M. Tiuri, S. Urpo (Editors): Space Activities in Finland in 1980, 12 p., 1981. M. Tiuri, S. Urpo (Editors): Space Activities in Finland in 1979, 10 p., 1980. M. Tiuri, S. Urpo (Editors): Space Activities in Finland in 1978, 11 p., 1979. Space Activities in Finland in 1977, 8 p., 1978. Space Activities in Finland in 1976, 9 p., 1977. Space Activities in Finland in 1975, 9 p., 1976. M. Tiuri, S. Urpo (Editors): Space Activities in Finland in 1974, Radio Laboratory Report S 72, 9 p., 1975. M. Tiuri, S. Urpo (Editors): Space Activities in Finland in 1973, Radio Laboratory Report, 7 p., 1974. M. Tiuri, S. Urpo (Editors): Space Activities in Finland in 1972, Radio Laboratory Report S 52, 9 p., 1973. M. Tiuri, S. Urpo (Editors): Space Activities in Finland in 1971, Radio Laboratory Report S 50, 10 p., 1972. M. Tiuri, S. Urpo (Editors): Space Activities in Finland in 1970, Radio Laboratory Report S 39, 8 p., 1971. M. Tiuri, S. Urpo (Editors): Space Activities in Finland in 1969, 7 p., 1970. M. Tiuri (Editor): Space Activities in Finland in 1968, 4 p., 1969.